In a mixing bowl, combine all ingredients, except French bread; stirring until well blended. Cut a thin slice from top of bread loaf; set slice aside. Using a gentle sawing motion, cut vertically to, but not through, bottom of the loaf, 1/2 inch from the edge, to cut out center of bread. Lift out center of loaf. 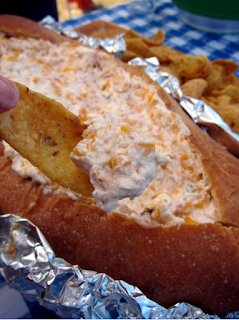 Fill hollowed bread loaf with the dip. Wrap loaf with foil. Bake dip at 350° degrees for 1 hour. Serve with reserved bread cubes, crackers, or potato chips.